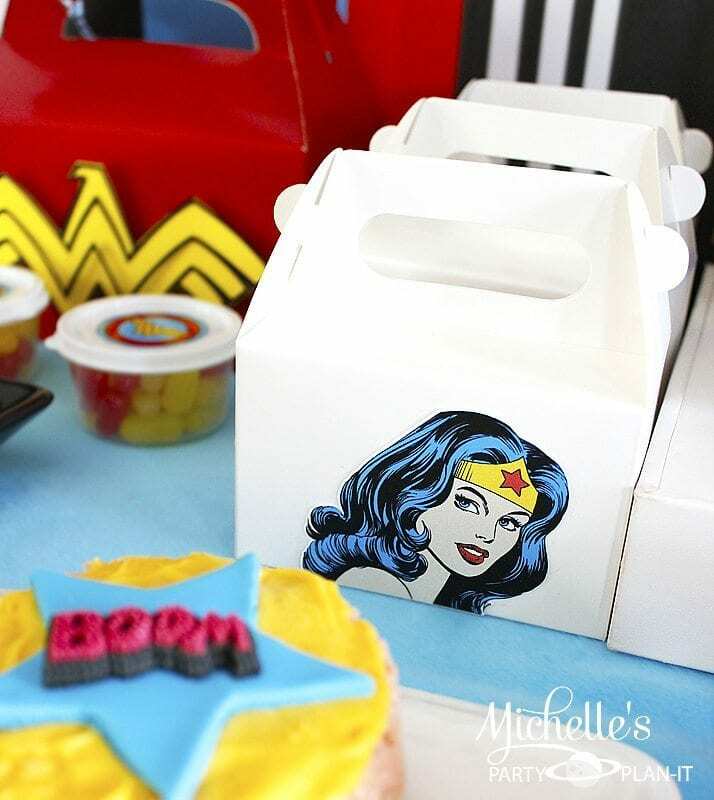 Wonder Woman has been my favorite superhero since I was a little girl so naturally I had a blast creating this dessert table featuring our latest Superhero party backdrop. 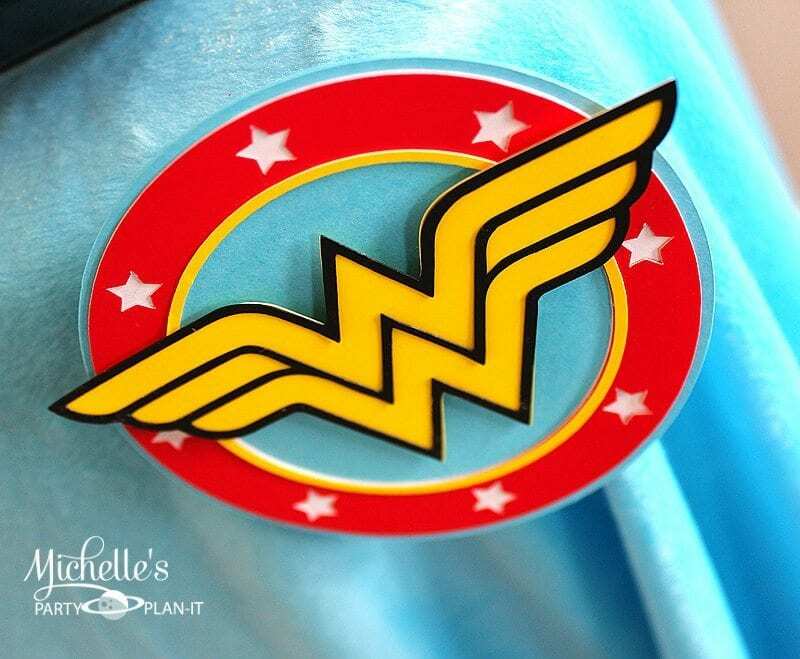 Wonder Woman has gone through several looks through the years, but my favorite has always been the Wonder Woman I remember from when I was a little girl in the early 80s. 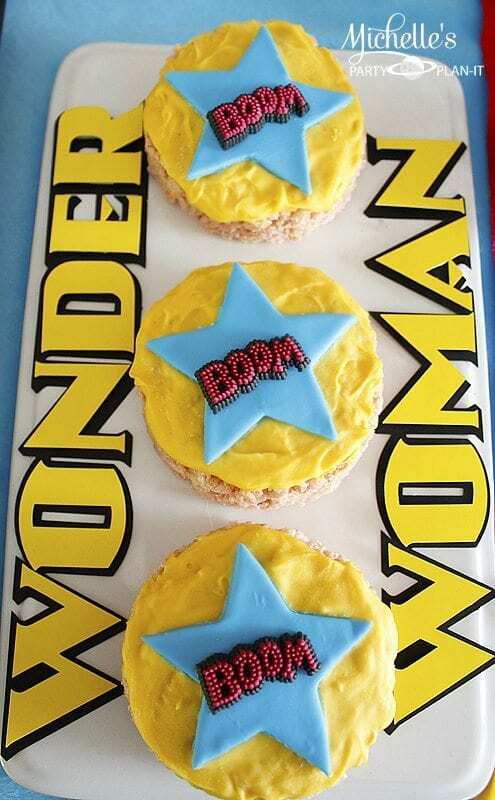 I loved watching the TV show with Lynda Carter and I even remember having Wonder Woman underoos! I wanted a retro comic feel with red, turquoise and yellow as the main colors. 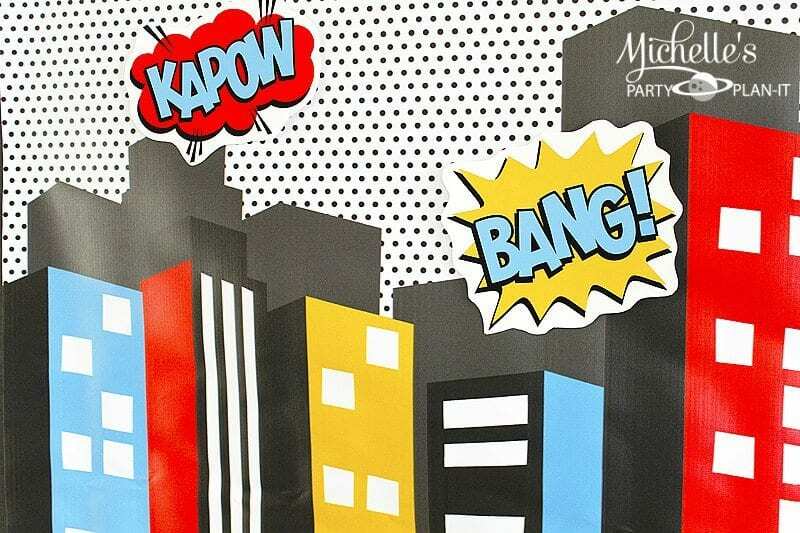 I started with a black background and our Superhero party backdrop. I added the cut out action words for extra flair. 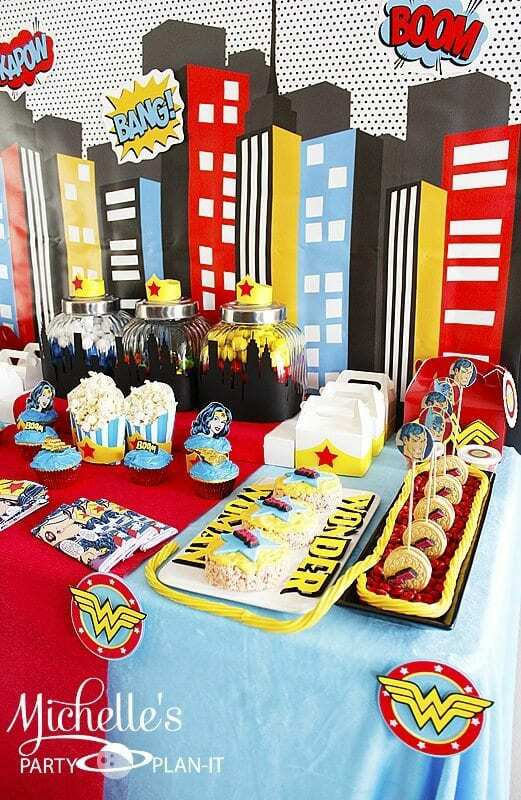 Using my Silhouette, I made black cityscapes to wrap around the candy jars, Wonder Woman crowns for cupcake wrappers and treat boxes, Eagle chest emblems for the treat boxes, Wonder Woman logos and cupcake toppers. 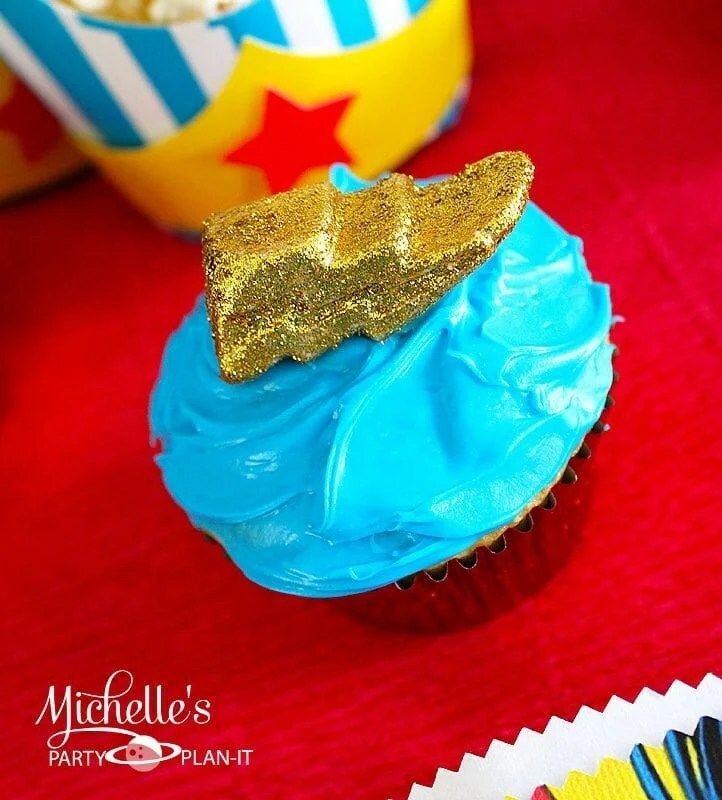 I made cupcakes with gold lightning bolt fondant toppers and candy covered cereal treats topped with fondant stars. 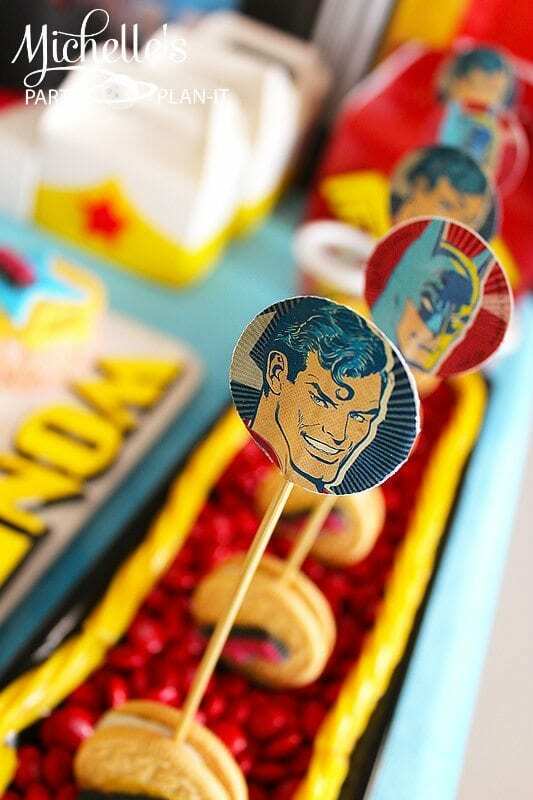 I topped golden Oreos with the retro candy decorations that I found at Target on clearance for 50 cents along with the Superman and Batman party picks I also found on clearance. 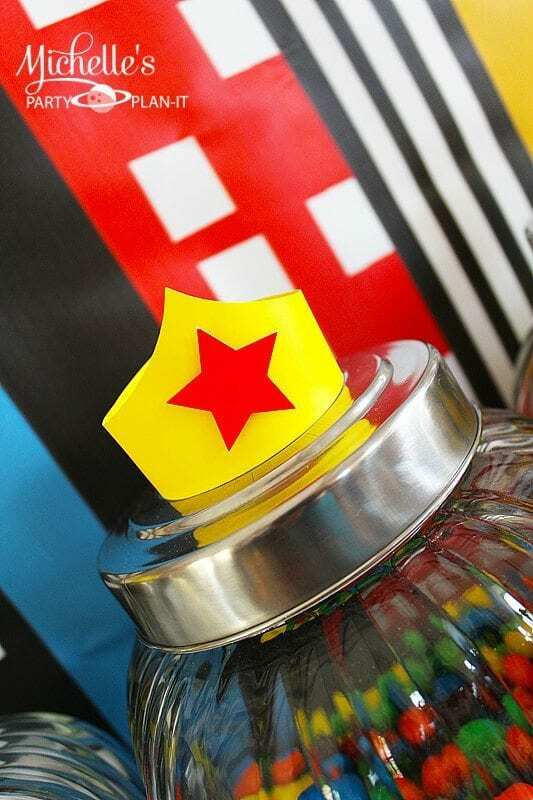 I filled the candy jars with gumballs and m&ms, and used yellow Twizzlers as Wonder Woman’s lasso. 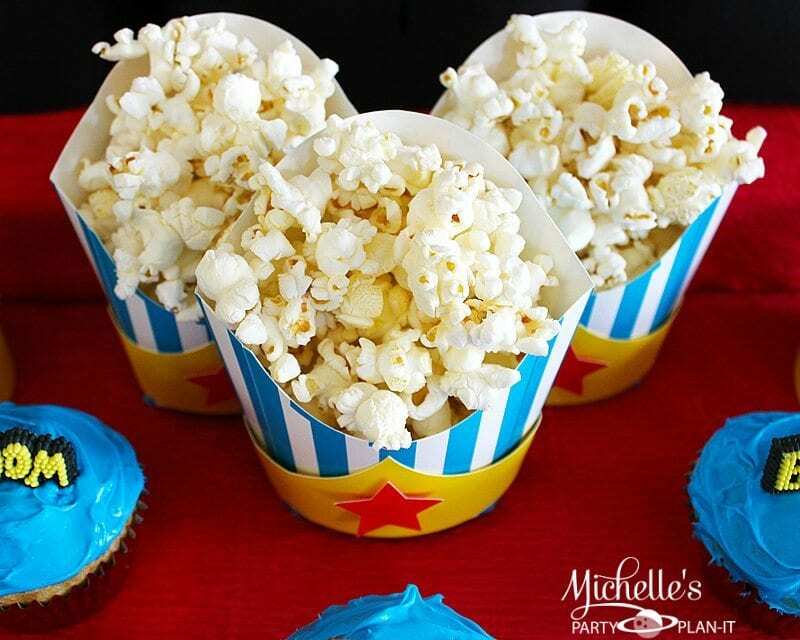 I filled striped popcorn boxes with popcorn and wrapped a crown around the base. 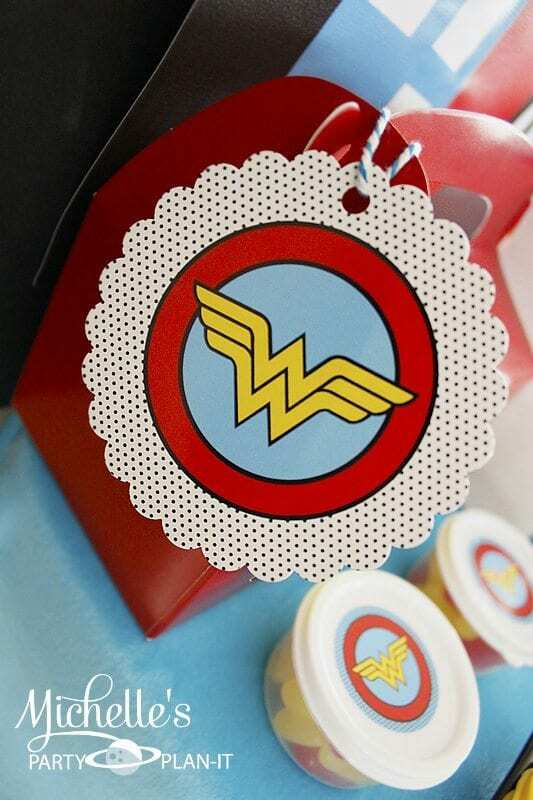 I made Wonder Woman stickers for the small candy containers and favor tags for the large favor boxes. 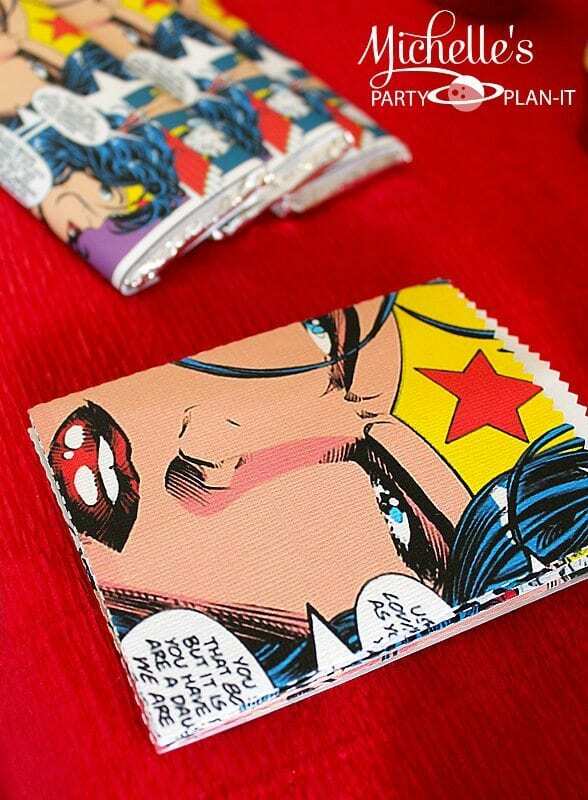 I wrapped candy bars with comic pages I printed and also made matching treat bags. 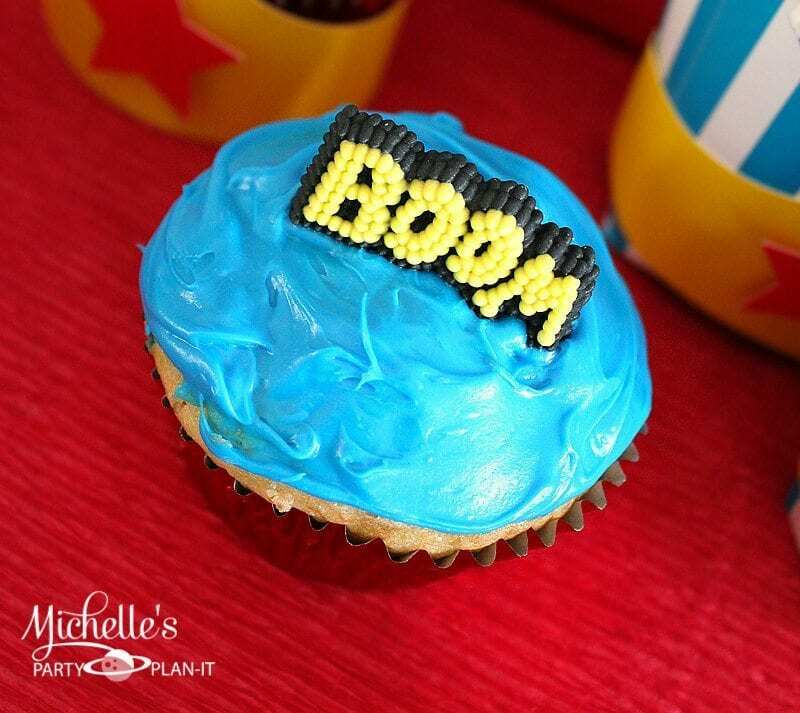 Remember those icky candy decorations we used to get on our cakes in the 80s? I was so excited when I came across these at Target! Nothing says retro like these candy decorations! 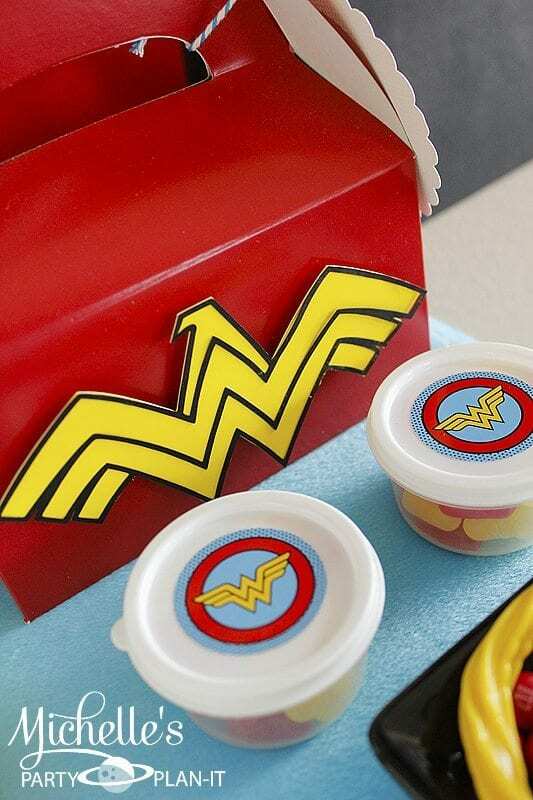 I found a silicon lightning bolt ice tray in Target’s dollar spot and used it to make these fondant toppers. Super easy! 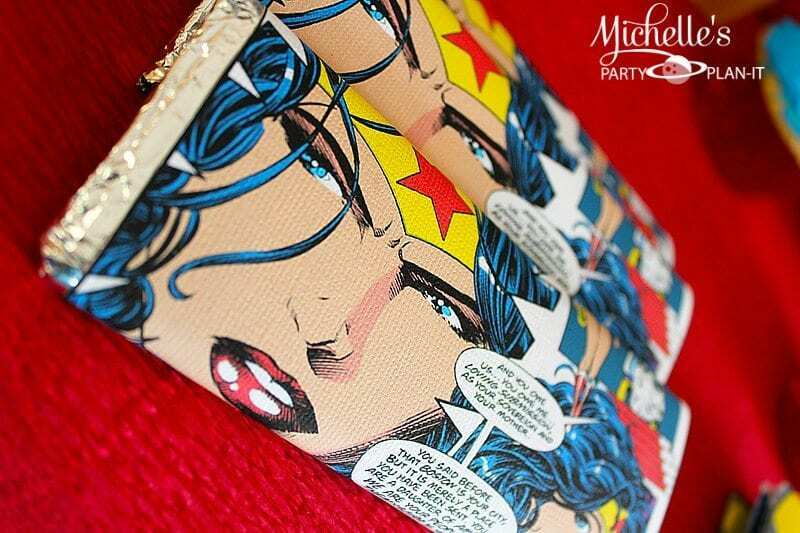 Did you know Wonder Woman has been romantically linked to both Superman and Batman? What a lucky lady! 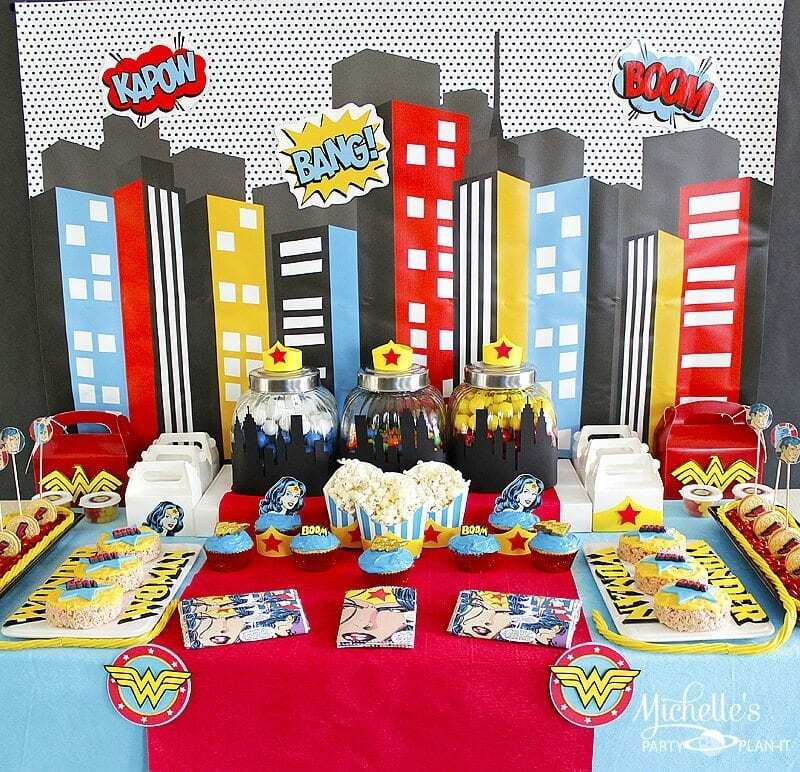 Our new backdrop isn’t limited to Wonder Woman, it can easily be used for Superman, Batman, Spiderman and other popular superhero themed parties! 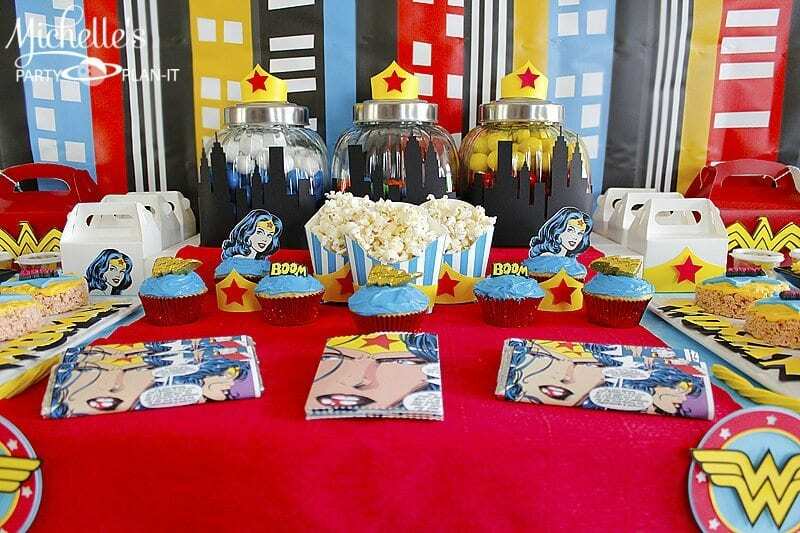 I think this theme is one of my all time favorites, I hope you enjoyed it as well and find lots of inspiration for your next Superhero party! 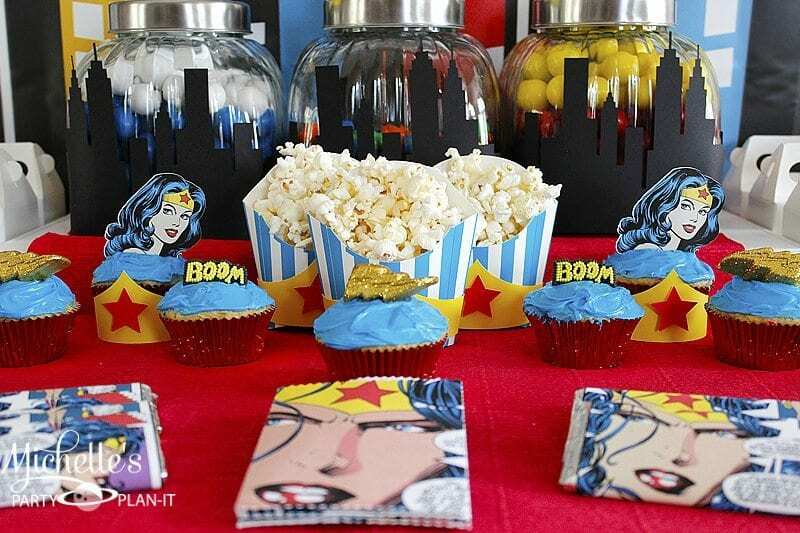 Note: The Wonder Woman party stationary created for this party was for my personal use only. 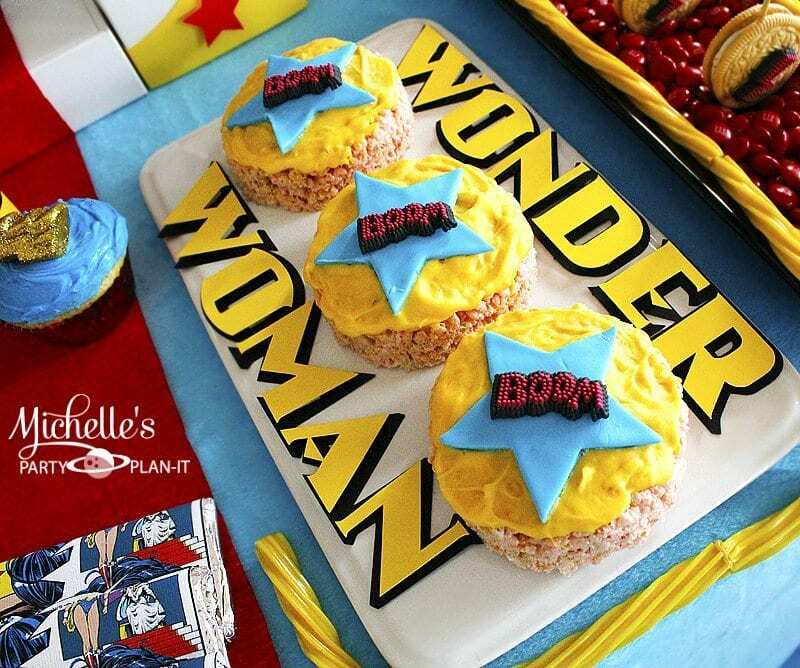 They are not licensed products and are not for sale..
Hi Michelle! 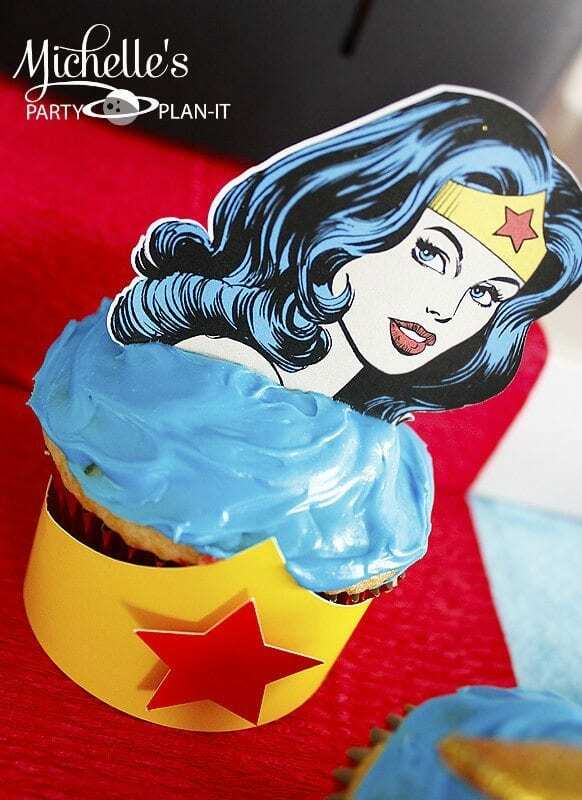 I am planning my daughters Wonder Women party and I am having trouble finding plates and napkins with Wonder Women? Where did you find them? 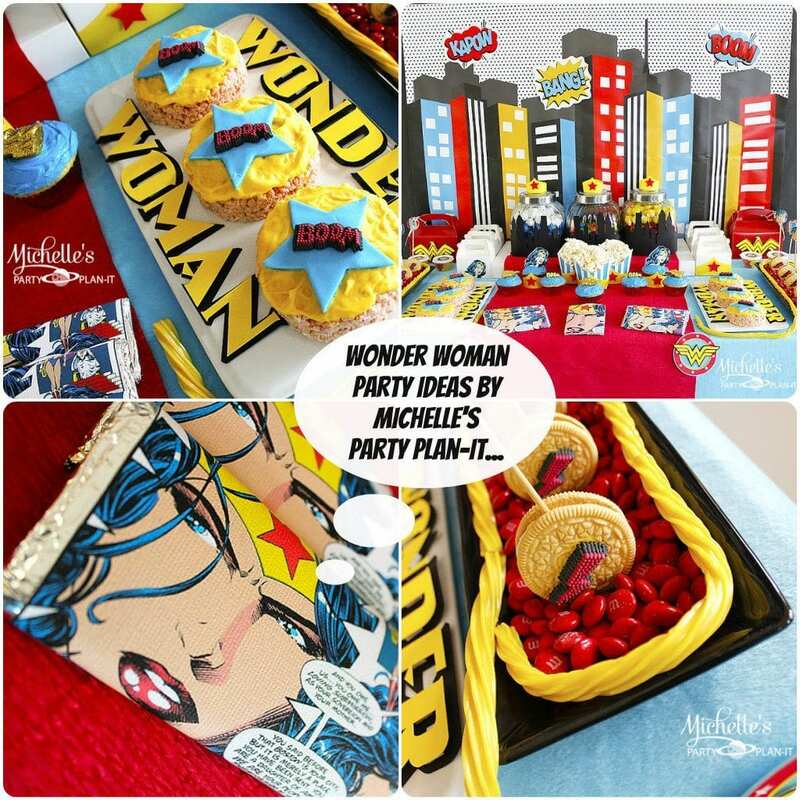 Thanks for your fantastic and super cute party details!!! 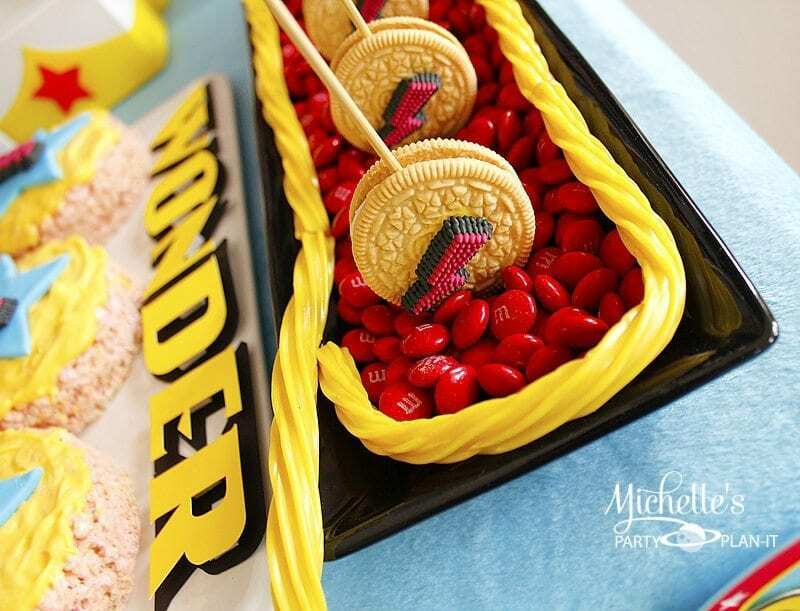 I am in love the with rice krispy treats. 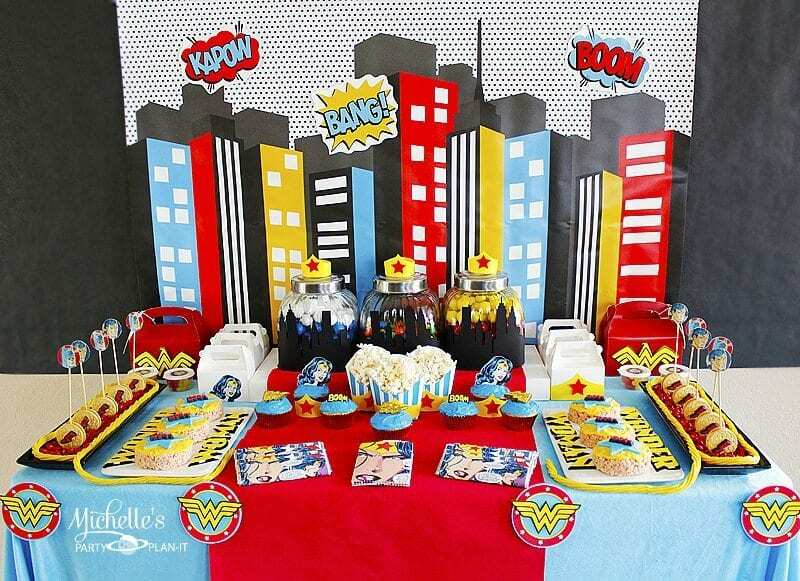 Looks like a fantastic party theme, so fun and creative!